Fixing up a bathroom doesn’t need to cost a fortune. However, even little fixes here and there can help when it comes time to sell. Here are some quick and easy fixes you can make to help give your bathroom a facelift. Sometimes, a simple change in paint color can make all the difference in a room. It can make it seem brighter, bigger, and cleaner. If your cabinets are particularly dingy, try a new coat of paint or sanding and refinishing. The easiest way to do this is to detach cabinet doors and remove drawers and paint them in an open space. 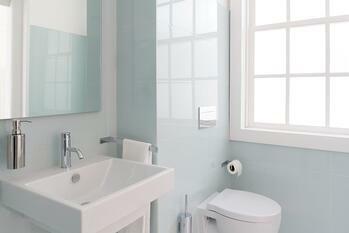 A simple change of your mirror can give your bathroom a whole new life. Instead of the basic square or rectangle mirror try a round one or something with a frame that compliments your color scheme. You'd be surprised what a big difference this can make. If the water pressure in your shower or sink seems low, before replacing it, try cleaning it. Fill a small baggie with vinegar and tie it around the showerhead or faucet. This will help to loosen water deposits that may be slowing down the flow of water. This is a relatively simple and inexpensive fix that can instantly update the look of your bathroom. This is especially important if your bathroom cabinets and drawers don't match. Even if the rest of your bathroom is immaculate, one broken tile can ruin everything. Use a small hammer of chisel to remove the broken tile, making sure to keep the surrounding tile intact. Clean the area before placing a new tile and check if there's an issue that may have caused the tile to break. If you need a little extra cash this summer for some home renovation projects, try a home equity line of credit. Like a credit card, you can access funds as you need them at a lower interest rate as compared to a traditional loan. For more information, contact us at mortgages@cypruscu.com or call (801) 260-7600 ext. 5330.